I am not sure where to start with this. I am all over the place, and I have been all over the place. And tomorrow I am going more all over the place. My physical and mental beings are in limbo and transit all at once. My mind feels as if it is the spin cycle of a washing machine. Everything churning and spinning with no time to stop and reflect. No moment or opening to move forward. I have just returned from a very short, intense and emotional visit to Scotland, with highs and lows. Precious time with family, especially my father who continues to display incredible strength despite his frailty and years. The sudden, cruel loss of my brother in law, stolen by a hiding cancer, believed to have been eradicated by the best of treatment completed only a few weeks ago. A long haul flight nursing a dramatically coloured and swollen leg, damaged thanks to pavement aerobics caused by an unfortunate combination of numb and clumsy Taxotere toes and a sneaky paving stone peeking up over its allocated territory. The rare gathering of close family over steaming mugs of tea and coffee and delicious comfort food. Hushed conversations. Rushed purchases. Heavy skies. Welcome laughter. Heart-wrenching smiles patchworked over wounds. And as an unseasonal challenge Scotland organised blankets of snow over brave crocuses and daffodils as a picturesque backdrop. My return travel deposited me back in hot and sultry Yangon some 28 hours or so after I had left family in Scotland before sunrise in sub zero temperatures and into a sky full of snow waiting to fall. Now, only a few days later, I am still not quite able to rest. My half unpacked bag is now being re-packed ready for the short flight to Bangkok. And the main reason for this unrest is the prospect of yet more checks. More blood draws from an arm so bruised I cannot see my own vein, scans to seek out anything which might be hiding and the usual investigation into anything which might hint at something sinister. I am exhausted with it all, yet I know it is what I need. I know that without these checks, my mind darts into those dark, frightening places. My Doctors and I are on the same page. By the end of the week, I hope that I will be n the other side of this heaviness and limbo and able to move on in whatever direction that might be. I know that my physical and emotional fatigue is colouring my spirit and mood. I understand it. It just is what it is. In all this turmoil and shift, this feels like the right time to change my background image. While everything is so thrown up in the air, taking its own time for the different elements to drift back down and settle. This image speaks to me right now. 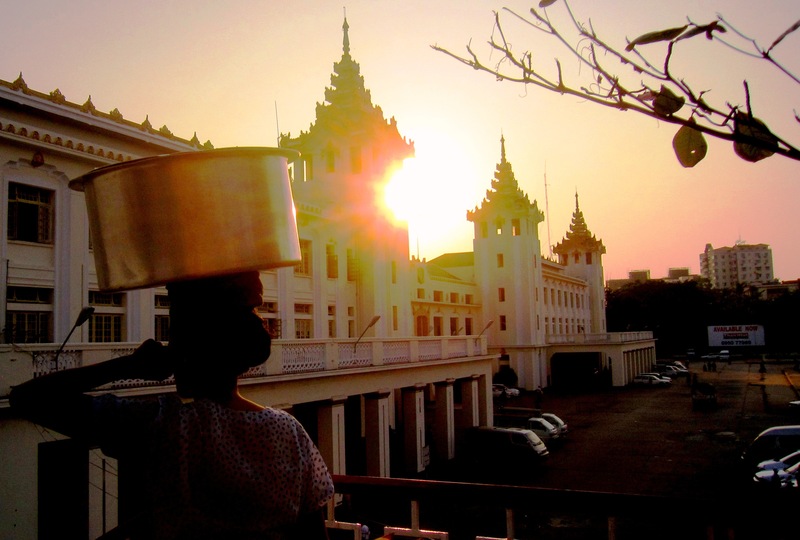 The sun is setting on a heavy day’s work in Yangon outside the Central Railway Station. This woman is carrying her burden on her head, keeping her hands free and her posture proud. Her silhouette speaks of determination and strength, as it absorbs the soft rays of the sinking sun. And of inspiration and clear direction. In direct contrast to being all over the place. Enough of the emotional and mental side of cancer. it is time for me to offload, I mean update about the physical side. Twang Arm has not had a lot of attention here these past weeks, so I thought I should make amends for this neglect. Last week has also marked 10 months since my last Taxotere chemo, and it is interesting to see how my body is recovering and what signs remain of the Chemo Club. On one hand (or should that be arm), the lack of rant about Twang Arm must reflect the fact that its role in my life is reduced and it is causing less hassle. However, if I have to be honest I think that it also goes to show that we have entered a phase of “comfortable cohabitation”, similar to a political coalition of forces who share no love for each other and would in fact be keen to eliminate the opposition. I have, simply put, become used to the limited movement and discomfort and it is more subconscious than uppermost in my thoughts these days. However, when I try to remember what Twang Arm felt like I am sure that it hurts less. I am stronger when I swim (and faster – though let’s not get too excited about my Olympic prospects). It is not painful unless I stretch it beyond its range of motion. That is definite progress. However, as Dr W said at my check last month, “it is not good enough”. My range of motion is still significantly restricted. I have to stand on my tip toes to turn the light on if I use Twang Arm. When I lift my arm beyond a certain position, the Twangy bits just don’t let me move it any further, even though I think there is a very gradual, continued improvement. So it is time to enter a new phase of confrontation with Twang Arm. I am not going to settle for this limited use but am going to continue to push those boundaries. Very slowly and gradually. 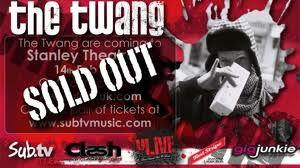 But shhhhhh, don’t tell Twang Arm as I need to keep the advantage! Taxotere really hammered my fingers and toes. I had neuropathy (numbness) for a long time afterwards and in fact still have the slightest residual numbness in my fingertips and a sensation of my toes being too big for my feet. It is improving happily, even although it is a slow business. But my nails have really suffered. My fingernails still break if I bump them and I keep them very short to try and prevent this. My toenails have been somewhat more gross. I developed a blackened big toe nail not long after chemo finished and that is slowly growing out. As well as being discoloured though, it is also very ridged and rough in the same area. one of my other toenails, the middle toe of my other foot, decided at this incredibly late stage to jump ship just over a week ago. It had started growing very irregularly and roughly and seemed to be loose. Inevitably, most of it fell off a few days ago and the remaining bit of nail is particularly ugly. I have to put this in perspective though. If the fast growing cells in my finger and toe nails have had had such a hammering, then it must show the kind of damage that all fast growing cells must have taken thanks to both chemo regimes. I have to focus on the fact that any sneaky cancer cells will have had the same battering and, I hope, the same destruction. For the effects of Taxotere to be so evident in my extremities, it must demonstrate that the chemo has reached every micro cell in my whole body. My discoloured and disappearing toenails are hopefully a sign of the destructive nature of the treatment on its target – the cancer beast. The nails are by-casualties of the treatment. I can’t avoid a discussion on the side effects of chemo, without giving the subject of hair loss its due attention. This is something I still find difficult. My hair is growing. It is in the region of 2 – 3 inches now, very approximately. But I still look very different to how I did at the start of this cancer encounter. It has come back in a mouse-grey like colour and although it is darker than it was when it first came in looking like cotton wool, it has that “grey look”. And I would be lying if I said that I didn’t mind it being grey. I do mind. I don’t want grey hair. I want my brown-with-a-hint-of-chestnut-if-I-want-to-wallow-in-fantasy hair back. I had the question of hair dying on my list when I saw Dr W2 last month, but with all of the fuss and discussion about my badly behaved port, I forgot to ask him. And I am not sure if there is a hairdresser here who would have the experience of dying foreign (non jet black) hair which has had chemo. However, much as I am unhappy about the colour, I am intrigued with the texture. My flat as pancake pre-chemo hair has also disappeared and in its place curls are continuing to develop. This has meant that although my hair is getting longer, it does not really look long, especially at the front. It is a bit wild and crazy at the back and sides, but still points skywards and means that my forehead is still rather bare. This means that when I look in the mirror, I still see chemo hair. I know that is rather contrary but that is the way it is! I love my curls and am fascinated to see how much more they will grow before my hair remembers it is meant to be straight and flat. And I am loathe to cut off these precious curls. After writing this on Saturday, I decided to get my hair cut after all, on Sunday. Boy, am I glad I took the plunge! As well as having a delicious hour long shampoo massage, for the first time in my life I think, I walked out of the hairdresser’s with a smile on my face. My chemo hair had been transformed into a proper hairstyle. It looked like a hairdo and not as if I am forcing re-growth. It has been a long time coming. I lost the last of my hair in November 2009 and I have resented my reflection in the mirror since then. But I don’t want to delete the previous paragraph as it shows so clearly how much of a difference this has made. Not when, but if? …… Surely not! As I near the finish flag in the Triathlon of heavy duty treatments I yearn more and more to get back to something like the way I used to be. I know that it will take time to feel better, to get my own legs back and be able to do many of the things I used to be able to do. The side effects of chemo have been a real mixed bag of delights. It is no secret that I struggled particularly with the loss of my hair as I have ranted about it on various occasions. I am sure it is no surprise then that one of the biggest things I look forward to is not seeing Dr Evil in the mirror any more!! I remember so clearly, that day in November just after chemo 2 when I became bald. I remember sitting in the chair at the hairdresser as the last of my hair fell to the floor under the clippers and being unable to stop the tears. The shiny white scalp was such statement that I really, really was a cancer patient. I have never been able to get used to being bald and I have really focused on the fact that hair loss from chemo is a temporary thing. In fact, the one thing I really need to hang onto at the moment is the belief that my hair is coming back, and coming soon. 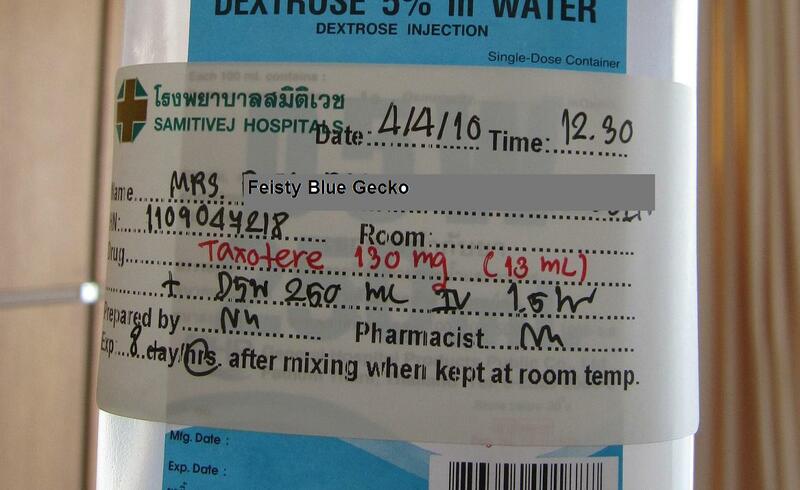 After all it is over a month since my last infusion of Taxotere. The fine covering of duck down must evolve soon into proper hair, mustn’t it? So when I read this recent article suggesting that permanent hair loss after Taxotere is more common than we often expect, it was not a welcome piece of information. According to the research, the numbers are people who experience permanent alopecia are not huge, but large enough to be significant – estimated at around 1 in 16. One interesting discussion is that some people feel that they would have chosen not to have had Taxotere if they had been aware of this increased probability of permanent hair loss. That really made me stop and think. I cannot imagine that I would have even considered not having Taxotere, no matter how difficult I found the side effects, even if I had been aware that the hair loss could be long term. Survival and recovery and the topmost priorities for me, given my diagnosis and pathology. Oddly, the thing on my mind is more about how I felt that day in November particularly, and how I feel every time I look in the mirror at Dr Evil. It was hard enough knowing my hair and I were parting company (no pun intended). I do not know how I would have felt, and how I would have coped, if it had even occurred to me that this loss could be permanent. I will be looking even more closely at the duck down from now on and let’s hope it does decide to thicken, grow and darken. I have been a real misery guts the past few posts! It is time for a change in attitude I think! Well, last night I went out. As in, an evening out to meet friends. 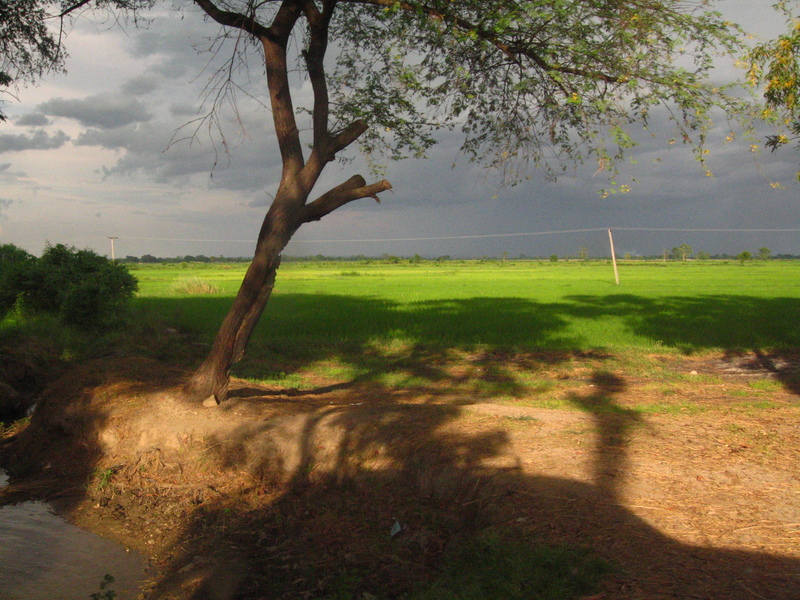 In the evening! I realise that this is the first time I have been out at night for a good couple of months. I have just not had the energy or felt in the slightest like anything more than a coffee or snack in the daytime. Of course, my encounter with pneumonia, on top of nasty Taxotere really put the finishing touches on any desire to have any social life. When I had the chance to meet friends last night, the fact that I felt like meeting up in the evening was a very clear sign that I must be feeling better. OK, I was heading home around 9 pm after a lovely meal and lots of catch up chat, but that is real progress. And do you know the best thing? The first thing my friend told me was how much better I was looking! She was emphatic in saying this was because she saw such an improvement and stressed this several times. 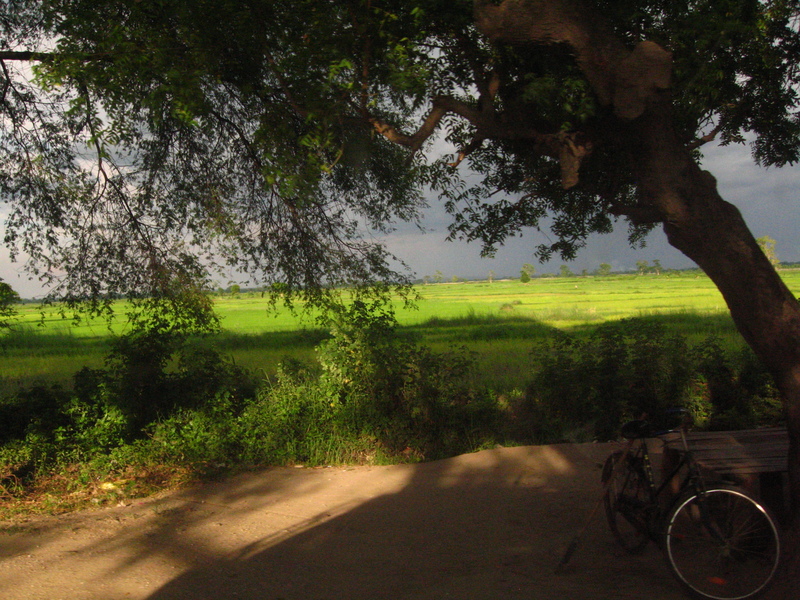 The last time she saw me was in Yangon not long after I had had pneumonia, when I was at a bit of a low. It did me the world of good to be told that and today I have felt a teensy bit stronger and better. So I celebrated by meeting another friend this afternoon and I definitely felt brighter and stronger. That is a very clear reason to be cheerful! I know this probably sounds a bit corny, but this picture really reflects how I am feeling. The huge chemo storm clouds are there, but the greatest anger and strength of the storm are passing and the sun is starting to shine through. The past three days have definitely seen a shift and the slight improvement I felt on Friday is still there. I am far from running around (still hardly hobbling around!) but my legs are still less leaden and just feel that teensy bit “better”. I know this is a long haul, and the taxotere effects particularly are going to be with me for some time. As I write this, my nails are continuing to deteriorate and the neuropathy (numbness) in my fingers and now in my toes is getting worse rather than better. I also know that this can take weeks if not months to get better and I could be left with a slight loss of sensation permanently. But, I feel better so that makes a difference! There is another reason why these pictures are significant for me. I took the photographs while traveling last September, only 11 days before I discovered the lump and my view and my world changed. I know I was oblivious to the presence of the lump when I was focusing on the what was happening around me and I can’t quite remember what it was like. It feels like a lifetime away. Yesterday was really quite a strange day. Firstly, I did not have my usual pre chemo, mega jitters and nerves. I am not quite sure why not. Part can be attributed, I am sure, to the uncertainty about whether or not I would be well enough and therefore there was no point in being too scared. Logical, no? But in fact, I think it was more due to the fact that after 7 chemos, a bout of pneumonia and the scary IV antibiotics, another chemo and its familiarity finally did not feel just so intimidating as it used to. Ironic, no? Why could this not have kicked in 5 chemos ago? I turned up at Counter 2 as usual, handed over the slip and when the nurse said “blood test” I made sure that this would be taken by the oncology 5th floor staff. I waited for a while but no sign of the familiar all white uniform for quite a while. Then a porter arrived to take me to the 5th floor! Unexpected, but never mind, I followed to the Oncology Ward and there was shown to my room and waited for the nurse. She expressed concern about my recent infection and said that there might well be a delay but it would depend on the blood work. I asked if we should put on the numbing cream or not if it was unsure. “Oh, yes. Put it on!” She was clear – if chemo was to go ahead then much better to be prepared. AFter all, the cream could easily be wiped off if not. She struggled a little to find a space to draw blood and my poor little vein was still tender. Again the blood was reluctant to clot and required a good bit of pressure to stop the bleeding, which was really quite painful. I have to stress though, that as ever, these nurses are just amazing and ensure that this is as painfree as possible. So we headed back downstairs to wait for the results to come through and to see Dr W2 and her the verdict. I had my other BP, temperature and weight checks and all was well. Although I was a bit surprised to see that I had lost over 3 kilos in the intervening 3 weeks. Hmmm, did the pneumonia do that or is a sign that I am really struggling to eat properly now? Finally we were called and took ourselves and the X Ray from Yangon into Dr W2’s room. He went through the blood tests and said that my white cell and neutrophil counts were normal now, and red blood counts had gone up enough to allow chemo to go ahead without transfusion! Amazing what determination can do! He then had a listen at my chest and seemed happy that it sounded clear. He had a look at the X Ray from Yangon and immediately ordered a follow up X Ray. He felt that I had had a virus as well as the bacterial infection which is why I had gone down so much and also why the monsterbiotics and IV ones had taken a while to kick in and for the fever to go down. His verdict? With satisfactory blood work, no fever and apparent recovery from the infection, pending the review X Ray, he felt 90% sure that chemo 8 could go ahead! Gosh! So we were carted of to imaging and I had a super fast X Ray with no comments about biopsy scars. Within 10 minutes the results were with Dr W2, he had reviewed them and I was pronounced fit for the final zap. We were escorted back up to the 5th Floor and back to the room where I had been earlier. On with mind-numbing reality TV – my usual strategy for dealing with port preparation. I seriously recommend it for the whole chemo process! 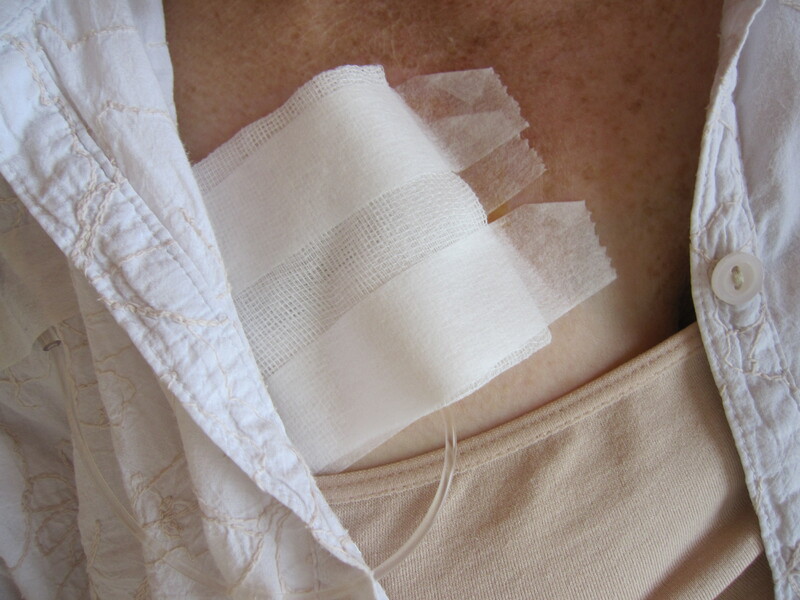 For the last time, I was prepared, the numbing cream wiped off, the area swabbed and sterilised, surgical gauze placed surrounding the area and then the ripping of the package which signified the port needle. OK, the usual, breathe in, breathe in, breathe in…..hold…………… and for the last time the needle was in. Phew! No final surprises or problems with my wonderful port. Did I call it wonderful? Hmm, a strange time to develop a more positive relationship with my port!! The series of syringes with anti side effect meds went in first and a vicious army of biting red ants marched again as I squirmed awkwardly. Each time they seem to bite a bit harder and I find it increasingly uncomfortable. The nurses find my reaction really amusing! I had half an hour of saline after this to get the side effects well flushed and then the final taxotere was unceremoniously brought in and hooked up. Have a look at the label in the pic, and all its detail……………..
As always, it is infused slowly as it has a high risk of allergic response. 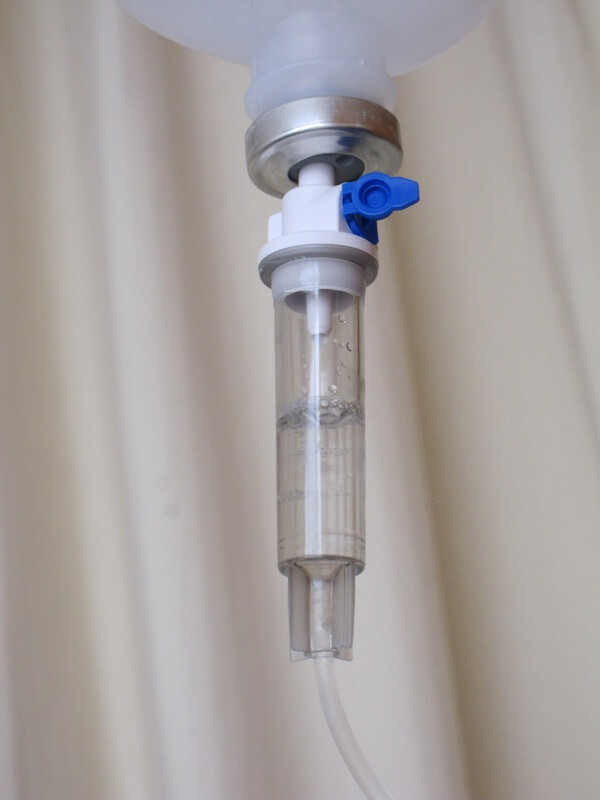 For over one and a half hours it worked its way into my system until finally the machine beeped to signify the end of the infusion, and the nurse monitored as the final drops left the bottle and entered my blood stream. Another series of syringes and the final anti clotting agent and it was time to remove the needle. I breathed in, in, in- and held and out came the needle. And then the weirdest thing happened. I was completely overcome, and cried like a baby at this decisive moment. It was totally unexpected and I am not quite sure what happened. I think a mix of relief, disbelief that it is finished, and after months of holding things together during the chemo procedures I was overcome by the enormity of what I have been through. I have since heard from many other women that they also wept buckets at the same point. It reminds me a little of when you are in the midst of a family emergency or crisis and you just have to keep everything together, but when you are told everything is all right, that is when you crumble. After the crumbly moment, I gathered myself, switched off the reality TV and got ready for the outside world again. I will come back and see my 5th floor angels to thank them properly once I am clearer about the next steps and less wobbly. After the usual signing of papers and collecting another bag full of medication, we were back out in the warm evening and quickly home. I am still having a bit of difficulty letting it sink in that Sunday 4 April really was the 8th and final chemo. Rocky (1 and 2) and I have finished our 8 round Boxing Match and the score seems to be Rocky -8, FBG – 8!! But I have this naughty compulsion to run up behind him when he is not looking, and tweak those sensitive little hairs behind his ears and bring him to his knees like he has done to me!! Maybe I will keep that one up my sleeve! Chemo might be done and dusted, but there is no chance of dust gathering under my feet. Final chemo was yesterday, and Radiation Therapy Consultation will be tomorrow! Things are moving rapidly forward. The most important thing is that I know that once this set of side effects pass, then I will start to feel better and slowly recover. I hope that I will get my strength, energy and immune system back gradually – and I hope that means I will start to feel well again. I can’t wait! 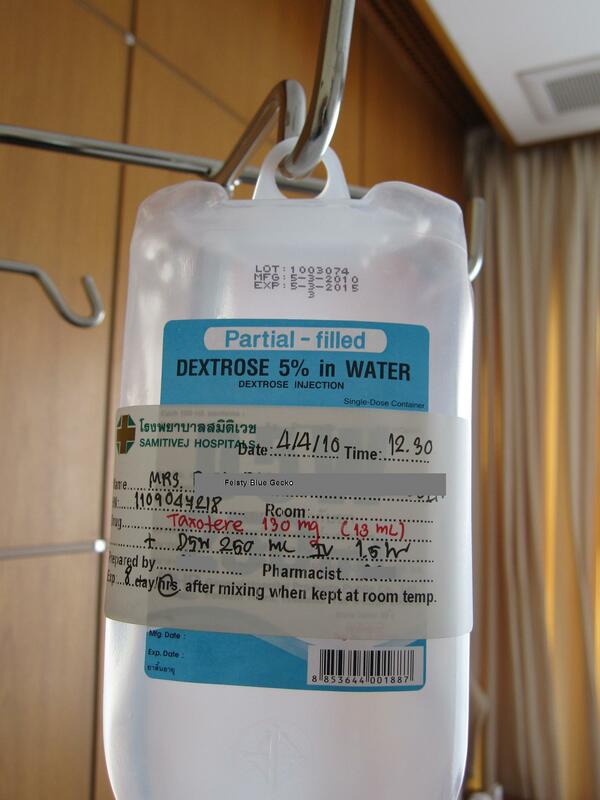 More details later as I am too wiped out just now, but here is a picture if the final drops of taxotere being infused into my chemo weary veins. Name, date and time are all there on the bottle to record this historic moment formally. It’s been a long and emotional day. I feel drained and overwhelmed, and too frightened to be overly glad I am through with it all – in case I ever have to come down this path again.